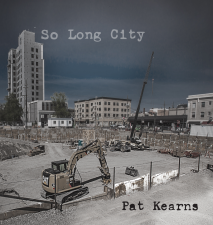 If I had any sort of musical talent, I might've put out an album like Pat Kearns' So Long City. He sings about the things I've lived through, such as moving to new places, trying to make and keep new friends, being on the road, getting away from it all and leading a simpler life. Like me he's a hobo at heart, not necessarily folksy in a Woody Guthrie sort of way but just sort of perpetually in motion, restless and looking forward to noticing and mentally cataloging all the new vistas. Even the chord progressions on his acoustic guitar are vaguely familiar--like I've stumbled onto them before while practicing. As a result, I made an immediate emotional connection with these songs, one I didn't expect. If I could sing, and I really can't, I might even sing like him. He has an affable and clear voice, sort of a mix between Jeff Tweedy and Bob Weir, with just a touch of Jeff Buckley for the more dramatic moments. There's a likability here that seems to bleed through the fairly conventional song structures, like you're finally getting to see the hometown kid on a big stage and he's far better than you thought he'd be. Turns out I've heard Pat Kearns before. 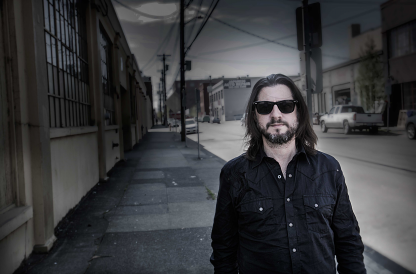 He fronted the Portland band Blue Skies for Black Hearts for many years, and I reviewed his CD back in 2014. Kearns had focused more on a power pop sound back then, very much in the mold of Big Star. So Long City delves more deeply into alt-country--it's driven by acoustic guitars, pedal steel guitars and even the occasional Dylanesque harmonica. It's surprisingly breezy and it goes down easy. Ultimately it doesn't matter since the album ends on such a strong note with the gorgeous and lyrical "Will You Come With Me Where I Go." This is where the aforementioned Jeff Buckley emerges in Kearns' voice and he feels like he's putting everything he has into this song. I'm not talking about belting it out a la "BabopbyeYa" but rather settling into a beatific rhythm and letting everything you have to say gel into one perfect little tune. Every time I play it for other people, they ask "Who is that? It's good."